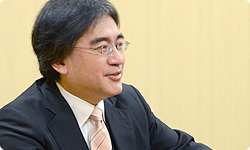 Today is like “The Former President Asks.”1 1The Former President Asks: Satoru Iwata once served HAL Laboratory, Inc. as president. 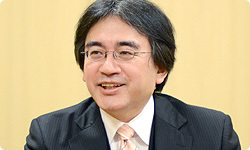 While he was there, the company developed Kirby’s Dream Land, Super Smash Bros. and other titles. You went to Nintendo after I had been at HAL Laboratory2 for about four years, so it’s been about 11 years now. 2HAL Laboratory, Inc.: A video game developer. Also called Haruken for short in Japanese. That’s right. Shall we start by discussing those 11 years, Kawase-san? Okay. 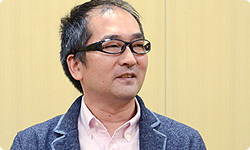 I’m Shigefumi Kawase, this game’s producer. First, let me say thank you to everyone who’s been waiting. 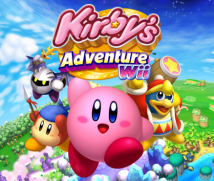 We’ve finally made another Kirby game for a home console. Oh, believe me, I’m not! (laughs) But after that, it never got updated, and I’m sure some people would wonder and ask, “What ever happened to that game?” To some, it had become an object of mystery. The release date went unannounced forever. Yes. Actually, there are three lost Kirby games. The first one is the one that pictures were shown of at E3. 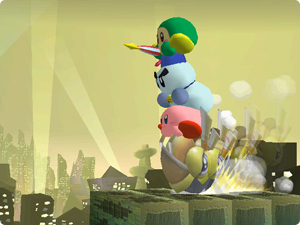 It was a Kirby game based on the concept of four-person simultaneous gameplay. That was when I learned how difficult it is to make a game that is both multiplayer and single player. If it had come out, it would have been soon after Kirby Air Ride .7 7Kirby Air Ride: An action racing game released for the Nintendo GameCube system in June 2003 in Japan. That’s right. The second one was an experiment with extremely challenging gameplay that placed Kirby in 3D space and allowed players to move around freely. But unfortunately, we weren’t able to achieve the quality we hoped for and it never reached completion. The third one involved an animated Kirby, sort of like a pop-up book. We renewed the Copy Abilities, and tried to power it up. We spent 11 years… making and abandoning these three games. The third one involved an animated Kirby, sort of like a pop-up book. We renewed the Copy Abilities, and tried to power it up. We spent 11 years… making and abandoning these three games. During that time, screenshots were shown and release dates went unannounced for a long time. Then the Nintendo GameCube system changed to the Wii console. Miyamoto-san says that video games are something you never really complete. It’s hard when a game simply refuses to come together. We wanted to bring it out when the fans wanted, but the movement wouldn’t feel right or we wanted to deliver more of a surprise to the fans, and we couldn’t bring one out in a final form. We experienced that difficulty for 11 years. I understand. Next is Kumazaki-san. Could you tell us about how you were involved and your history with the Kirby series? Sure. 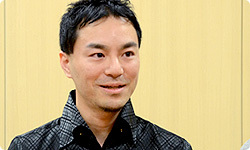 I’m Shinya Kumazaki, director of Kirby’s Adventure Wii. I was mainly involved with overall supervision and adjustment of the game, and I also did some writing of the script and game text. I’m glad to be here. I’m glad you could come. I became involved with this project in March 2010. Earlier, I had worked on Kirby: Power Paintbrush 8 and was director of Kirby Super Star Ultra .9 Later on, I worked on built-in software for the Nintendo 3DS system, but along the way, the idea of making a Kirby game for the Wii console came up, and the project came my way. 8Kirby: Power Paintbrush: A stylus-controlled action game released for the Nintendo DS system in March 2005 in Japan. 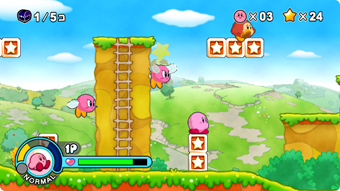 9Kirby Super Star Ultra: An action game released for the Nintendo DS system in November 2008 in Japan. When that project came up, what was the state of affairs? 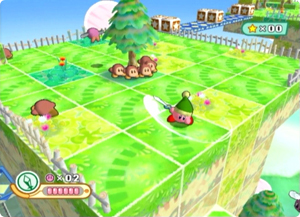 The third attempt at a new Kirby game had been called off and each one was in a state of partial completion. You had output from the three lost Kirby games, so you began by deciding what to use, what to make from scratch, and how to bring it all together. Yes. I was at the company the whole time working on another project, and as an outsider I had been watching them work on a new main Kirby game. I’ve been at the company exactly ten years, so I’ve been watching as an outsider the whole time a main Kirby game didn’t come out and thinking about it. Oh, I see. A game in the main Kirby series hasn’t come out since you joined the company. Exactly. For home consoles, that is. I had plenty of time to think about it. But when it came to actually making one, each team had put a lot of effort into their work, so I felt restricted from changing it, taking it apart, rearranging and remaking it because they had put effort into it. You were bearing ten years of other’s effort. But when game development goes well, you can finish in a year and a half. At first, I was told I had a year and a half. (thinking a moment) No, I thought, “We’ll do it!” I thought that because my experience working on Kirby Super Star Ultra would come in useful. I suppose you had a keen sense of what it was like to remake something with a high concentration of Kirby components. What do you think made it possible to actually finish this time? A big factor was the effort everyone put into achieving what we wanted to make.